This means that the first discriminant function is a linear combination of the variables: -0.403*V2 + 0.165*V3 – 0.369*V4 + 0.155*V5 – 0.002*V6 + 0.618*V7 – 1.661*V8 – 1.496*V9 + 0.134*V10 + 0.355*V11 – 0.818*V12 – 1.158*V13 – 0.003*V14, where V2, V3, … V14 are the concentrations of the 14 chemicals found in the wine samples. For convenience, the value for each discriminant function (eg. the first discriminant function) are scaled so that their mean value is zero (see below). The function calclda() simply calculates the value of a discriminant function for each sample in the data set, for example, for the first disriminant function, for each sample we calculate the value using the equation -0.403*V2 – 0.165*V3 – 0.369*V4 + 0.155*V5 – 0.002*V6 + 0.618*V7 – 1.661*V8 – 1.496*V9 + 0.134*V10 + 0.355*V11 – 0.818*V12 – 1.158*V13 – 0.003*V14. Furthermore, the “scale()” command is used within the calclda() function in order to standardize the value of a discriminant function (eg. 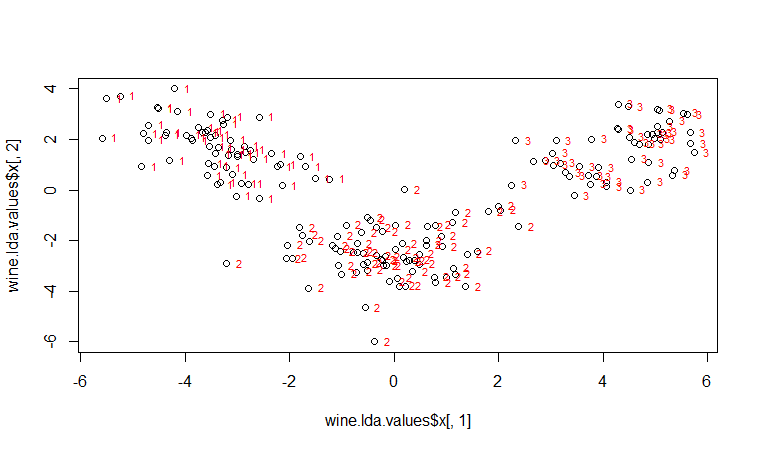 the first discriminant function) so that its mean value (over all the wine samples) is 0. 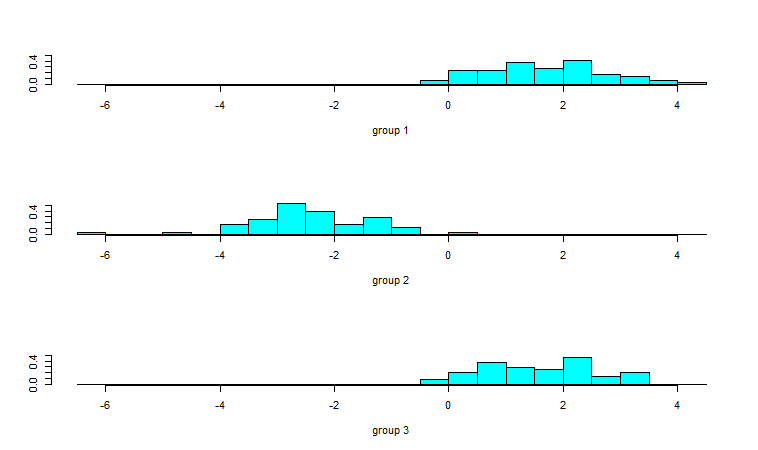 It doesn’t matter whether the input variables for linear discriminant analysis are standardized or not, unlike for principal components analysis in which it is often necessary to standardize the input variables. However, using standardized variables in linear discriminant analysis makes it easier to interpret the loadings in a linear discriminant function. 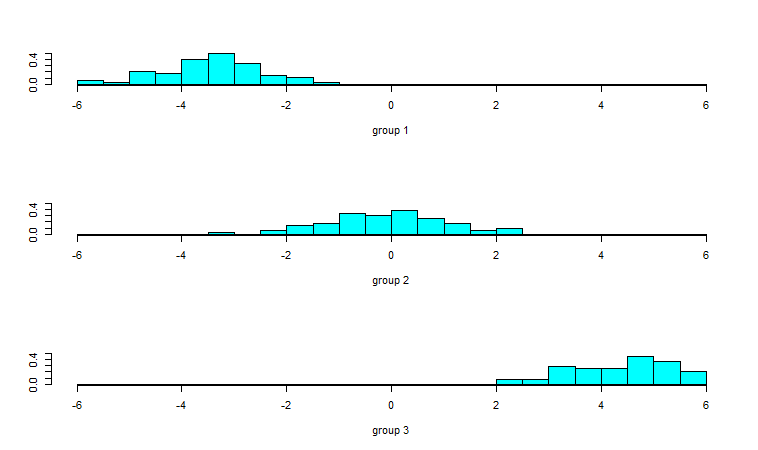 It makes sense to interpret the loadings calculated using the group-standardized variables rather than the loadings for the original (unstandardized) variables. In the first discriminant function calculated for the group-standardized variables, the largest loadings (in absolute) value are given to V8 (-0.871), V11 (0.537), V13 (-0.464), V14 (-0.464), and V5 (0.438). The loadings for V8, V13 and V14 are negative, while those for V11 and V5 are positive. Therefore, the discriminant function seems to represent a contrast between the concentrations of V8, V13 and V14, and the concentrations of V11 and V5. We can see that although the loadings are different for the first discriminant functions calculated using unstandardized and group-standardized data, the actual values of the first discriminant function are the same. To calculate the separation achieved by each discriminant function, we first need to calculate the value of each discriminant function, by substituting the variables’ values into the linear combination for the discriminant function (eg. -0.403*V2 – 0.165*V3 – 0.369*V4 + 0.155*V5 – 0.002*V6 + 0.618*V7 – 1.661*V8 – 1.496*V9 + 0.134*V10 + 0.355*V11 – 0.818*V12 – 1.158*V13 – 0.003*V14 for the first discriminant function), and then scaling the values of the discriminant function so that their mean is zero. "Number of samples of group 1 classified as group 1 : 56 (cutoffs: -1.751107 , NA )"
 "Number of samples of group 1 classified as group 2 : 3 (cutoffs: -1.751107 , 2.122505 )"
 "Number of samples of group 1 classified as group 3 : NA (cutoffs: 2.122505 , NA )"
 "Number of samples of group 2 classified as group 1 : 5 (cutoffs: -1.751107 , NA )"
 "Number of samples of group 2 classified as group 2 : 65 (cutoffs: -1.751107 , 2.122505 )"
 "Number of samples of group 2 classified as group 3 : 1 (cutoffs: 2.122505 , NA )"
 "Number of samples of group 3 classified as group 1 : NA (cutoffs: -1.751107 , NA )"
 "Number of samples of group 3 classified as group 2 : NA (cutoffs: -1.751107 , 2.122505 )"
 "Number of samples of group 3 classified as group 3 : 48 (cutoffs: 2.122505 , NA )"